Japanese AraliaEvergreen shrub. Large 16" palmate leaves add an exciting bold tropical look to the l..
Pineapple GuavaEvergreen shrub. Moderate growth with densely rounded form. Small red and white flowe..
Pineapple GuavaEvergreen shrub. Pruned into a single trunk tree. Moderate growth with densely rounde..
Pineapple GuavaEvergreen shrub. Trained to grow on a trellis. Moderate growth with densely rounded f.. Hybrid Creeping Fig ShrubEvergreen [semi-evergreen in colder areas] semi-vining shrub. 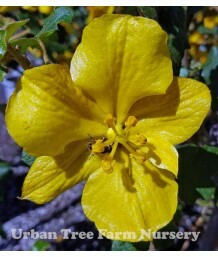 A unique hybr..
Flannel BushEvergreen shrub. 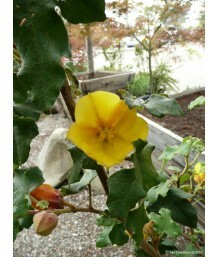 Hybrid of Fremontodendron californicum and F. mexicanum. 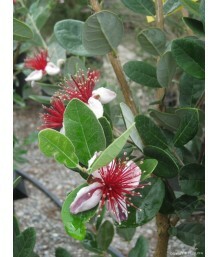 Velvety, deepl..
Flannel BushEvergreen shrub. Three pointed textured green leaves. 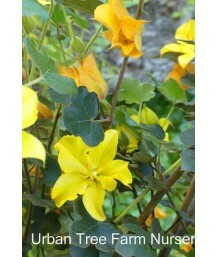 Blooms golden flowers with darker ..
Flannel BushEvergreen shrub. Moderated growth. Irregularly branching big shrub, broadly V-shaped. 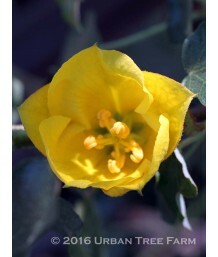 La..
Flannel BushEvergreen shrub. Moderated growth. Irregularly branching big shrub, broadly V-shaped. 1-..
Hardy FuchsiaDeciduous shrub. Evergreen in mild winters. Profuse production of drooping, long, red a..
Hardy FuchsiaEvergreen shrub. Upright habit. Medium green leaves on sturdy stems support an abundanc..
Hardy FuchsiaEvergreen shrub. Dense growth habit with exceptionally shiny green leaves. Masses of br..
Hardy FuchsiaDeciduous shrub. Arching habit. Small cream edged leaves. Violet-purple and crimson col..
Variegated FuchsiaDeciduous shrub. Upright growing habit with arching branches. Ovate, white-margine..